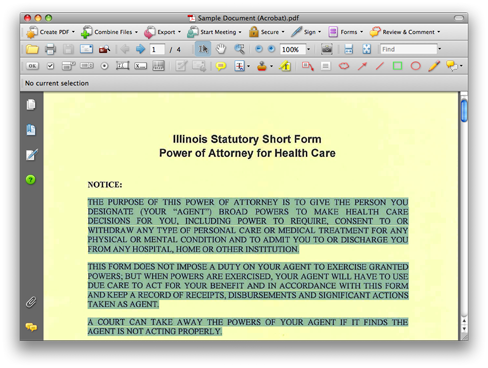 SmileOnMyMac just released the latest iteration of PDFpen, its PDF-editing software. 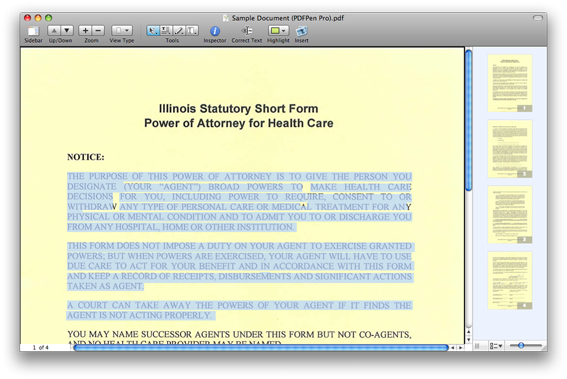 PDFpen comes in regular and Pro versions. PDFpenPro adds the ability to create forms and tables of contents. Both versions come very close to the feature set of Acrobat. PDFpen could be a very attractive solution if it can duplicate the features of Acrobat at a tiny fraction of the price (PDFpenPro sells for $99.95, Acrobat Pro – the only version available for Mac OS X – sells for $385.99 on MacMall). So how does PDFpen stack up? I like the interface. It’s clearly a Mac application rather than a transplant from Windows. Acrobat is pretty straightforward, but there is a little bit of culture shock when using it. Looks don’t matter, though, if it won’t get the job done. And thats where PDFpen still needs a little bit of polish. Of the PDF features I use regularly, OCR and text highlighting are two of the biggest troublemakers. I’ll discuss Acrobat first, since it serves as the benchmark. I haven’t upgraded to Acrobat 9 yet, so it’s possible (but, in my opinion, unlikely) that some of this has changed. Acrobat Pro does a good job of recognizing the text. The first image below shows the text that was recognized via the OCR. I have highlighted a portion with my cursor to better see where Acrobat found the text. The second image below shows the results of using the Acrobat Highlight Text tool on the OCR text. There are two problems with the way Acrobat handles OCR. Or maybe a better way to put it is that there are two symptoms of the same root problem. Acrobat OCR seems to revolve around finding lines of text. When I copy the text (after highlighting it as in the first image), it shows up in my word processor as separate paragraphs because each line is treated separately. Truly smart OCR would recognize paragraphs of text. This lack of understanding by Acrobat is also evident when using the Highlight Text tool. Notice the gaps in yellow highlighting between some of the words. Acrobat again seems not to have recognized that the words are part of a continuous block of text. Still, Acrobat is serviceable. PDFpenPro begins well, asking me when I open the document if I want to OCR the page or the document. Unfortunately, the goodness ends there. Large sections of the PDFpenPro OCR text were filled with garbage characters. I tried OCR on a few documents with a white background and the results were much better. Clearly PDFpenPro is having trouble with the ivory paper. That’s a troubling sign and makes me wonder how well PDFpenPro will OCR a brochure or presentation. Sometimes we don’t care about the text, and OCR is just used as to be able to highlight the text for a presentation. 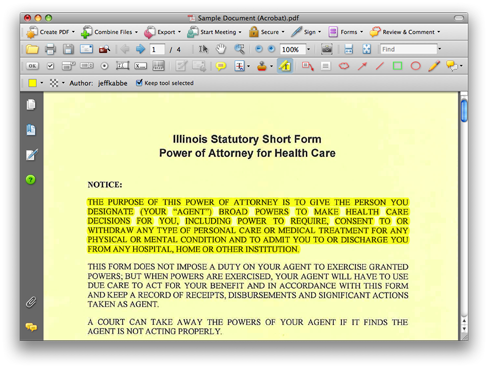 I used PDFPenPro to highlight the same text as I highlighted in Acrobat. As you can see from the second image below, the resulting PDF was unusable. Note that, unlike with the OCR, the highlight text tool gave the same results for a white paper scan as with the ivory paper. Acrobat’s not perfect. But PDFpen’s current problems are show-stoppers. PDFpenPro is missing some important features too. The comparison chart on SmileOnMyMac’s website shows a few of the advantages of Acrobat Pro. Conspicuously absent from that list is one of the most important features for attorneys – redaction. Until PDFpen gets reliable redaction tools, it won’t be able to replace Acrobat in my workflow. So I am a little disappointed. As much as I like Acrobat, I was hoping that PDFpenPro would work as a drop-in replacement. Hey, I like competition! Maybe with a little more testing and a few additional features, it will finally get there. A solid year’s worth of progress. Nothing special was announced (unless you’re a BSG, Office, or Heroes addict), just solid progress. One of the biggest surprises of the summer has to be Chrome, the open source web browser from Google. Chrome for Windows was released today, with versions for Mac and Linux coming later. Google put together a web comic describing their rationale behind Chrome and its major features (its also available as a Google Book). The best way I can describe Chrome is to say that it’s designed for web applications, in contrast with other browsers which were designed primarily for web pages. Because of its architecture (described in quite a bit of detail in the comic), Chrome should be more stable and responsive when one tab or window gets a bit unruly. I have downloaded and installed Chrome – a process which was surprisingly quick – but haven’t had a chance to put it through its paces. The few sites I did visit loaded quickly and everything seemed quite crisp. I look forward to the Mac version of Chrome.